In 2017 archaeologists Meg Conkey, Dan Sandweiss, Ryan Wheeler, and Nancy Gonlin founded the Journal of Archaeology and Education. The journal is hosted at the University of Maine’s Digital Commons website. JAE originated with Peabody Advisory Committee chair Dan Sandweiss during strategic planning work and inspired by the Robert S. Peabody Museum of Archaeology’s long history of using archaeology in the classroom, one which got a boost in 2002 when this focus became our raison d’être. There has been a growing interest in learning around archaeology—from college and university curricula to service learning, as well as archaeology in the high school classroom and initiatives like Project Archaeology. Despite many connections with allies at the Society for American Archaeology and the Archaeological Institute of America, practitioners in this area are diverse and only loosely connected. An open-access, online journal is one major step to foster a sense of community and create a platform to share everything from practice to theory and research. This format ensures equal access to interested parties, something which we all believe is critical. During the Society for American Archaeology’s 2017 meeting in Vancouver we held the inaugural meeting of the JAE editorial board, which includes members from museums, educational institutions, academia, government, and more. Editorial board members spent some time getting to know one another and brainstormed ways to encourage article submissions to the new journal. The Journal of Archaeology and Education is a peer-reviewed, open-access journal dedicated to disseminating research and sharing practices in archaeological education at all levels. We welcome submissions dealing with education in its widest sense, both in and out of the classroom—from early childhood through the graduate level—including public outreach from museums and other institutions, as well as professional development for the anthropologist and archaeologist. The journal’s founders recognize the significant role that archaeology can play in education at all levels and intend for the Journal of Archaeology and Education to provide a home for the growing community of practitioners and scholars interested in sharing their first-hand experiences and research. Nancy Gonlin is a Senior Associate Professor at Bellevue College, Washington. She earned her Ph.D. in Anthropology at The Pennsylvania State University, is a Registered Professional Archaeologist, and a former Dumbarton Oaks Fellow of Harvard University. Her specialization is the Classic Maya civilization of Mexico and Central America. Nancy is on the Editorial Board of Ancient Mesoamerica, published by Cambridge University Press. She has taught for over 25 years and is highly regarded for her pedagogical contributions – she is the 2012 recipient of Bellevue College’s Margin of Excellence. As an active member of the Society for American Archaeology, Nancy serves on the Committee on Curriculum and has been appointed as the upcoming Chair of the Book Award Committee. She co-author Copán: The Rise and Fall of an Ancient Maya Kingdom, and co-edited Commoner Ritual and Ideology in Ancient Mesoamerica, Ancient Households of the Americas, and Human Adaptation in Ancient Mesoamerica. Nancy’s fifth book will be a co-edited volume on a new field of research in archaeology, The Archaeology of the Night. As an online only, open access journal, JAE is designed for quick and timely publication of accepted papers. To that end, each year will constitute a volume and each article will be a separate numbered issue. As soon as an article is accepted in final version, copy-edited, and laid out, it can be published instantly. A quick Google search reveals that Ruth Benedict still looms large in the minds of contemporary anthropologists. Benedict (1887-1948) is known for many things—she was a favorite student of anthropology icon Franz Boas, she conducted multidisciplinary work across anthropology, psychology, and social science, and was close friend and confidant of Margaret Mead. Mead wrote a marvelous biography of her friend that gives her impressions alongside published and unpublished works by Benedict. Biographies continue to appear, including two dual bios of Mead and Benedict. Benedict wrote and talked about the paradigm shift in our field that she witnessed in the twentieth century as Boasian humanism gave way to scientific approaches. She famously argued that anthropology needed both. 1995 commemorative US postage stamp featuring Ruth Benedict. Along with a presence on the quotation websites, this quote has made the rounds as an internet meme (framed against a nice photo of Benedict) and, perhaps most famously, was featured in remarks made by President Barack Obama during a press conference with Afghan President Ghani on March 24, 2015. The President referred to his own mother’s training as an anthropologist, as well as Ghani’s background. The remark, however, doesn’t specifically attribute the quote to Benedict. Simon Kuper, writing in The Financial Times, has dubbed Barack Obama the “anthropologist-in-chief” and a number of others have pointed out that President Obama’s interest in anthropology has tracked a growing interest in our discipline. One version of the popular Ruth Benedict internet meme. Specifically too, that quotation has resonated with a lot of people, myself included. I added it to my e-mail signature sometime over the summer—a place that I usually reserve for my contact info alone. I did notice, however, that while the quote appeared on a lot of websites, there was never any specific source cited. Archaeologist Meg Conkey told me recently that she too like the quote, but was unsure of its origins. She asked me if I knew and pointed out a Reddit post about the quote. The Reddit post argues that “Ruth Benedict never said it, not in any of her published writings. It seems to be merely myth. It is never specifically cited, nor does it make historical sense. In her own time, anthropology was a SCIENCE, not a political party.” The post includes a long list of internet memes, blog posts, and other websites that all attributed the quote to Benedict, but with no specific reference to back it up. The quote aside for a moment, it is pretty clear that Benedict’s work had a strong political element. In many ways, as a cultural relativist, she sought to challenge American exceptionalism with her work. Benedict, along with anthropologist Gene Weltfish, prepared a pamphlet titled “The Races of Mankind” in 1943, intended as a guide for American troops operating overseas. This became an appendix to later editions of her 1940 book Race: Science and Politics, which makes both a humanistic and scientific case for the equality of all races. A first edition copy of Ruth Benedict’s book The Chrysanthemum and the Sword. Anthropologists certainly are a tough-minded lot, even if we get a bit loosey-goosey on our quotations. I suppose this is a consequence of progress, as brainyquotes.com replaces Bartlett’s. Johannes Fabian, in his 1983 book Time and the Other: How Anthropology Makes Its Object, makes much the same argument. Despite the shortcomings, Benedict has a lot to offer, from ideas about cultural relativism and race, to the direction that anthropology can take in the twenty-first century. As the contemporary scientific paradigm breaks free of its dialectic with humanism, can humanism assert itself in whatever comes next? Scholars, museum professionals, educators and interested members of the public gathered at Salem State University for a symposium that delved into the history and implications of slavery in New England. Essex Heritage organized this event to be interactive and engaging. In addition to scholars they also invited the participants to explore the topic through breakout sessions and facilitated activities. Beth Beringer of Essex Heritage invited me to lead one of the activities. During the morning session I lead participants through our History 200 lesson, The Little Spots Allow’d Them. Participants explored how landscapes can and have shaped human behavior using archaeological data from Isaac Royall’s Ten Hills Farm in Medford, Mass. (now the Royall House and Slave Quarters). The program then shifted to exploration of the difficult discussions that arise when confronting northern slavery. The experts on this panel had a diverse background as historians, professors, and museum professionals. They focused on meaningful strategies that could be used to engage any audience – classroom, museum goers, or the public – in a substantive manner. Keynote speaker (and ChuBbs Woodrow Randall enthusiast) Dr. Joanne Pope Melish spoke about the often complex relationship that New England had with the institution of slavery. She focused on the impact that this history has had on the region and its legacy today. Melish was also quick to point out that “rich men did not own slaves. Slaves made men rich” and how we need to shift the typical narratives used when engaging with students in any setting. There also was a group of museum educators who talked about their unique ways of engaging the public in the history of slavery in New England. Maryann Zujewski from Salem Maritime National Park has been working with Dr. Bethany Jay of Salem State University to reframe their interpretive tours so that they are not simply ADDING black people to history, but that they and other minorities are becoming more integrated in a meaningful and natural manner. Olivia Searcy discussed how she has helped to create the educational programming for the Royall House and Slave Quarters Museum in a manner that has focused on the history of the enslaved people at the site. The Caribbean Connections program from the House of the Seven Gables is a duel language program, described by Ana Nuncio as innovative in its outreach to minority groups in a community which might not otherwise feel welcomed in a museum setting. At the end of the day participants could self-select into a variety of breakout sessions to dive further into a topic of interest. This symposium was very important and offered me a great deal of new information and ways of thinking. I am already furiously at work on how to integrate all that I learned into the lessons and activities that I teach. I hope that another symposium of this kind will be offered again and I anxiously await word from my friends at Essex Heritage! Please join us for a special evening with award-winning Pueblo potters Dominique Toya, Maxine Toya, Nancy Youngblood, and Joseph Youngblood Lugo. Learn about contemporary Pueblo pottery making with these gifted artists while they visit Andover to work with Thayer Zaeder’s studio pottery classes. Dominique and Nancy have collaborated to create pieces that meld their unique approaches to traditional pottery construction, bringing together swirl melon bowls, glistening micaceous slips, carved designs, and blackware firing techniques. Maxine makes delightful figurines that draw on deep Pueblo traditions. Joseph Youngblood Lugo continues the Santa Clara tradition of carved blackware pottery, adding contemporary themes and motifs. These artists are passionate about their work and will share how they have melded traditional and innovative materials and methods to create contemporary works of art. We are happy to share the Peabody Museum’s draft strategic plan for 2015-2020, which charts the course for significant projects ranging from improvements to the historic museum building to enhanced physical and intellectual control over archive, photographic, and object holdings. The plan emphasizes elements of Phillips Academy’s 2014 strategic plan, especially around the pillars of Creativity and Innovation and Equity and Inclusion. Many of the most requested class units at the Peabody explicitly deal with issues of race, ethnicity, and gender, often in the context of Native American history. The new plan underscores the importance of anthropological perspectives in teaching in these areas and encourages continued good partnerships with Native American communities. The pedagogy of collaborative learning is central to the Peabody’s strategic plan, which stresses hands on learning, project- and problem-based learning, experiential learning, and informed discussion in all of the Museum’s student focused programs. Plans to significantly improve collections storage will increase accessibility and ensure that collections are available for use well into the future. Centralized storage of collections within the Peabody building will set the stage for expanded classroom space in the future and allow us to better care for our significant collections. Drop in for a fun-filled morning of archaeology activities at the Peabody! Build a LEGO model of your favorite ancient ruin, examine stone tools close up, play Native American musical instruments, and make your own Hohokam style etched shell. All families are welcome to join us; there’s something for every age! Friday, February 19 from 9:00am to 12:00 noon and Friday, March 25 from 9:00am to 12:00 noon. Call 978.749.4490 or e-mail rspeabody@andover.edu for more information. The Peabody Museum’s annual report for academic year 2014–2015 was published in November and highlights student participation at the museum, including more than 1,200 students who visited for classes, work duty, independent projects, and more! You can read the report in its entirety at http://issuu.com/phillipsacademy/docs/annual_report_2014_2015_final?e=1320520/31019317. On October 15, more than 100 sixth-grade students and teachers from West Middle School in Andover visited the Peabody as a way to kick off the beginning of their lesson in ancient history. The teachers thought it would be useful for their students to have a better understanding of how archaeologists come up with their explanations of sites, particularly sites that are very old. Using the museum’s Shattuck Farm mock excavation lesson as an example, curator of education Lindsay Randall taught the students how to read objects as primary sources. This allowed them to begin making inferences and complex connections regarding what they were viewing. 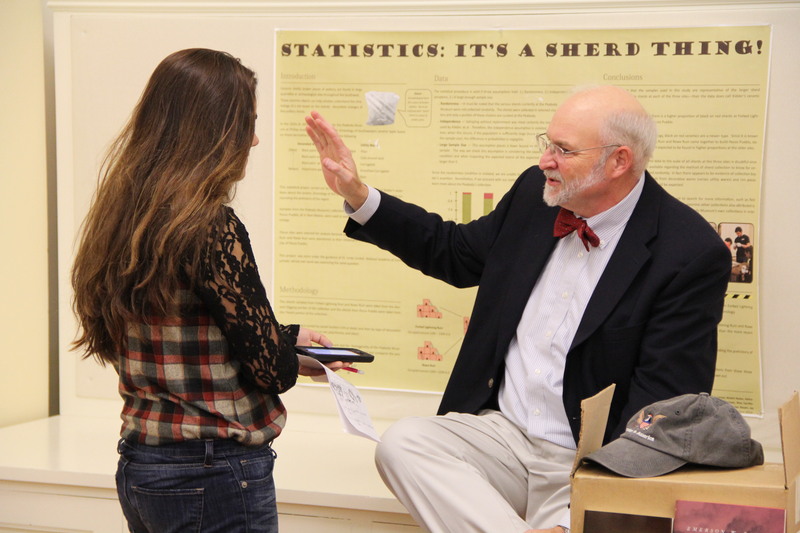 Dr. Emerson “Tad” Baker ’76 discusses his research with a reporter from The Phillipian. On October 20, Emerson “Tad” Baker, PhD ’76, delighted a packed Peabody Museum with his lecture, “Witchcraft, Counter Magic, and Archaeology in Salem and New England.” Drawing on details from his new book, A Storm of Witchcraft: The Salem Trials and the American Experience, Baker demonstrated that the practice of counter magic to ward off witches and demons in colonial New England persisted through the 19th century and continues today. Join the Massachusetts Archaeological Society (MAS) Gene Winter Chapter for their fall lecture series. Each month features a presentation by an expert about a variety of topics. All lectures take place at the Peabody Museum at 7 p.m. and are free and open to the public.